Sir Malcolm Rifkind MP opened the debate. He believed that the most dangerous consequence of Iran’s acquisition of a nuclear weapon would be proliferation in the region, with Saudi Arabia, Egypt and Turkey following suit and that by contrast, the downside risks of military action to prevent Iran from acquiring nuclear weapons capacity would be relatively brief. 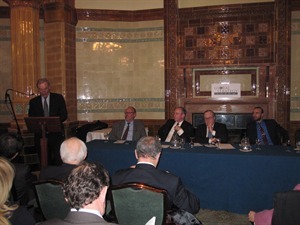 However, Sir Jeremy Greenstock, the UK Permanent Representative at the United Nations in New York (1998-2003) said that military action would not necessarily destroy Iran’s nuclear weapons potential and that sanctions should only be on the table as part of a wider conversation about Gulf security. Dr. Arshin Adib-Moghaddam, Reader in Comparative Politics and International Relations at SOAS feared that rhetoric towards Iran could ratchet up this year, as the prospect of war became a ‘masculinity test’ in the US election campaign and that policy towards Iran needed to distinguish between the Iranian leadership and the country itself with its rich history. 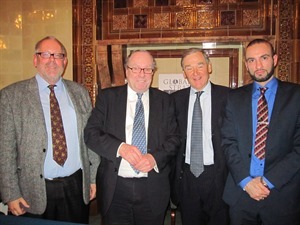 The writer, lecturer and broadcaster on international affairs, Jonathan Fryer (whose blog of the event can be read here:www.jonathanfryer.wordpress.com ) said that he did not believe that war with Iran was either inevitable or desirable, and expressed concern about the increase of pressure on Tehran by several Western governments, including Britain. He proposed a Middle East conference to look at the whole region and not just Iran in isolation, with the EU and US facilitating but not attempting to dictate an outcome. There was agreement amongst several of the panellists that there needed to be a broader and deeper conversation with Iran which went beyond negotiations on the nuclear issue. Click here to listen to the debate.